One popular and recognizable form of hinting is found in the TrueType font format, released in 1991 by Apple Computer. Hinting in TrueType invokes tables of font data used to render fonts properly on screen. 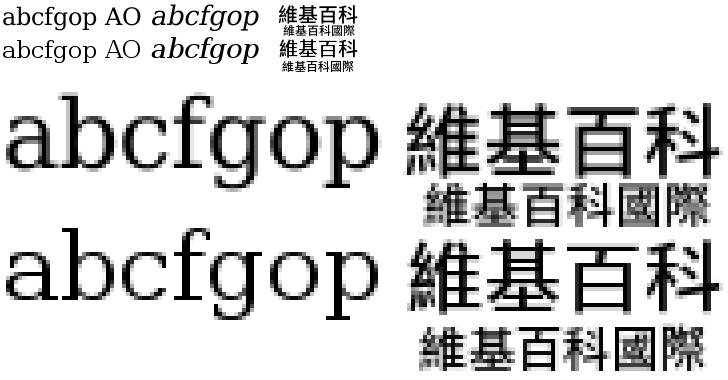 One aspect of TrueType hinting is grid-fitting, which modifies the height and width of font characters to line up to the set pixel grid of screen display. The open-source FreeType 2 font rendering engine uses an auto-hinter when such hinting data are not present or their use is restricted by a software patent. As of 2011, the FreeType Web site states that the relevant font hinting patents have now all expired, and hinting is now enabled in FreeType by default. ↑ "Georgia & Verdana — Typefaces designed for the screen (finally)". Daniel Will-Harris. 2003. Retrieved 2010-05-24. 1 2 "FREETYPE & PATENTS". the FreeType Project. 2009-06-09. Retrieved 2010-01-28. "TrueType Hinting". Microsoft Corporation. June 30, 1997. Retrieved November 6, 2007.